Reflexology is an art and science that is based on the principle that there are reflex points and areas in the hands and feet that correspond to every gland, organ and part of the body. 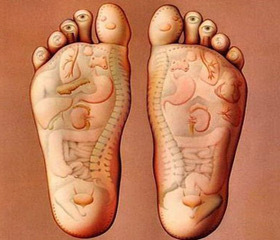 In essence, our feet and hands are a mini map of our entire bodies. By working on these areas with skilled finger and thumb techniques, the body systems are facilitated to a greater balance. Reflexology is received fully clothed and client is comfortably in a lying down position. Sessions can be from 30-90 minutes.